» Review: GEOFFREY HOLIDAY HALL – The End Is Known. 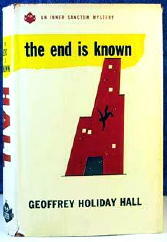 Review: GEOFFREY HOLIDAY HALL – The End Is Known. 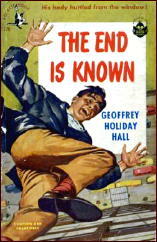 GEOFFREY HOLIDAY HALL – The End Is Known. Simon & Schuster/Inner Sanctum Mystery, hardcover; 1st printing, February 1949. Condensed version appeared in Cosmopolitan magazine, December 1950, as �Who Saw the Man Die.� Pocket #776, paperback; 1st printing, February 1951. Not a book nor an author I was familiar with when I was recently attracted to it by its cover, and for good reason, I think you might say. Geoffrey Hall wrote only one other mystery, that being The Watcher at the Door (Simon & Schuster, 1954), a spy thriller set in Vienna which got a short notice in Catalogue of Crime by Barzun and Taylor. In my opinion, though, I think The End Is Known should be far better known than it is. Far from being a spy novel, it�s a mystery that�s strongly in the Cornell Woolrich vein, as darkishly noir as you might want, and in some regards the writing is better than Woolrich�s. Full of strong imagery in the telling, there�s also more than a hint of humor, more than I remember in Woolrich�s. Of course it�s also time for me to go back and re-read all of Woolrich�s work. It�s been far too long, but in the meantime this singular book by Geoffrey Hall will more than do. I�ve also just discovered that, unknown to Al Hubin, a film has been made from The End Is Known, as an Italian-French co-production called La fine � nota (1993). One comment has been left, so a viewable copy must exist somewhere, and I�d love to be able to see it, wishing as I say that that I also understood Italian. Here�s the set-up: As department store vice-president Bayard Paulton makes his way home from work one evening, he is nearly hit by a man falling to his death from an upper story window. The apartment the man came from was his own, remarkably enough, and even more remarkably, Paulton does not know the man. According to Mrs. Paulton, the man, also unknown to her, came to see her husband, who was delayed and not yet home, and after a few minutes of pacing while he waited, before she realized his intentions, he opened a window and leaped out. Thus the other reason for the title. The man�s end is known. Bayard�s mind is quickly taken over by the mystery? Who was he? Why did he tell his wife �Your husband is the only man who can help me?� But then why didn�t he wait for Bayard Paulton to arrive home? What follows is Bayard�s attempt to trace the man�s life backward and then forward again to learn the answers to these questions and others. The police, in the form of Lt. Wilson, are interested, but after the body is claimed by an eccentric woman from Montana, who tells them that she only knew him for a few months herself while he was working for her in her diner, they (the police) have other more important things they need to be doing. The bulk of the book is therefore both fascinating and very talky. Bayard takes out newspaper ads to find people who may have known the dead man, and remarkably enough, he gets responses. This was the room through which Roy Kearney had wandered during those last minutes of his life; this was the carpet his feet had walked on; here, on this spot where Paulton was standing, here perhaps he had hesitated, motionless, while his mind flipped the coin of decision and watched it come up tails. �That was the morning it all happened and everything got wrecked,� Jessie Dermond said. Then she became quite still, even the rocking chair stopped moving. It was clear from her eyes, from her silence, from the quality of her voice before the silence, that that morning, so long before, was a morning she had forced as far into the back of her mind as she could; that was the morning of the day. Bayard Paulton did not speak. He did not, even, stir in his uncomfortable chair. Because Jesse Dermond�s features, her whole body, were too markedly revealing. They showed pain and sorrow and an incomprehension of the things that life could do to you. Any novel which begins at the ending, with a death that was inevitable, the final straw in a life of dreams, and the futility of those dreams, has to be noir. For this reason, among those I have already mentioned, as well as still others that I am respectfully refraining from passing along to you, I recommend this book highly. That Pocket Books paperback cover is probably more famous than the book, though it sounds like one to go on the must read list. As for books that start at the end, C. Daly King/s Obelists Fly High opens with the Epilogue and ends with the Prologue. Still, the gimmick is only good when it works as it seems to have here. The cover art is by Paul Kresse, and it’s an eye-catcher, all right. It’s also remarkably violent. In the 1950s, Pocket was no longer sticking to the dignified “literary” covers they’d used through most of the 40s. 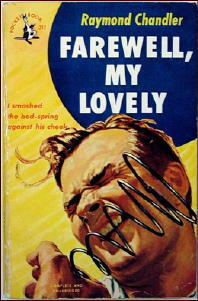 Here’s another one he did, this one of Raymond Chandler’s FAREWELL, MY LOVELY. I’ve seen his work now and again, but otherwise I don’t know anything else about him. Dear Mr. Lewis. Congratulations. First-rate review. In my humble opinion this book is a minor masterpiece, a forgotten masterpiece, a highly commendable tour de force. Who was Geoffrey Holiday Hall? The french Wikipedia : An american journalist, painter and decorator, born in 1913, in Santa Cruz, New Mexico. He died in 1981. “The End is Known” won a well deserved award: Le Grand Prix de Littéraure Policière (foreign) in 1953 and was nominated for The Best First Novel Edgar in 1950. As you said, Geoffrey Holiday Hall wrote another book (a good spy Thriller): “The Watcher at the Door” (1954). And then…he simply disappeared. Life is very strange, isn’t it Mr.Lewis? I am from Brazil (sorry about my english)and a translation of this book was published in Portugal, in 1955. I have a copy of this great book. Last but not least: Mystery File is a wonderful and unique blog. Congratulations again and please keep up the good work, Mr.Lewis. You are welcome, Mr. Lewis.